LEAN FOR IMPROVEMENT — This fine group took part in the first of what could be many Lean events at TradeNet, all intended to improve processes and better serve customers. Team members are, from left: Gardner Hart, Marketing; Susie Jaster, Graphics Arts; Robert Roullett, Shipping; Shawn King, Press; Maria Maun, Order Entry; Zach Melvin, Assembly; Scott Johnson, IT; and DeanNa Williams, OE/Customer Service. At TradeNet it’s all about providing customers with value priced, quality printed products delivered on time and as expected. “Lean” is the latest effort to continue that mission. TradeNet has embarked on the Lean Enterprise system to improve quality, eliminate waste and reduce delays. The first “Lean event” took place last week. A fine group of TN employees representing various departments stepped up to the plate. They spent four days determining how to improve the flow of job assignments from the time an order is received to when it’s shipped. General assessment from throughout the building is they done good! 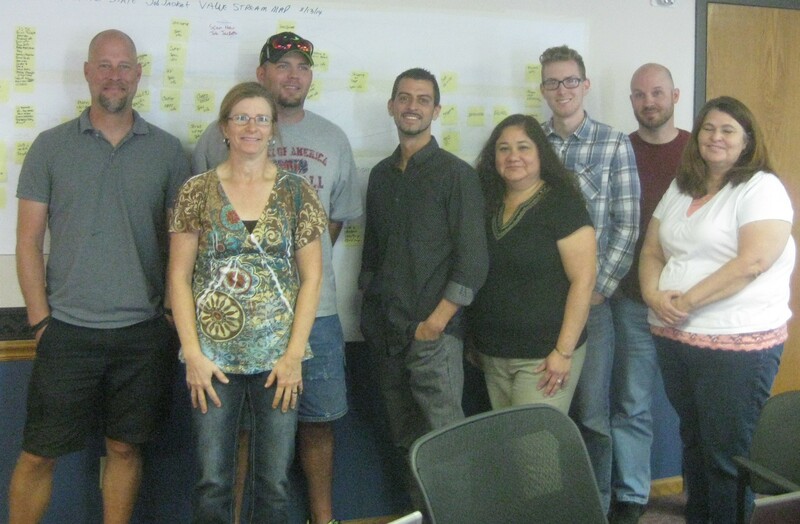 Thanks, Lean Team, for helping us Lean Into TradeNet and improve customer service in the process.